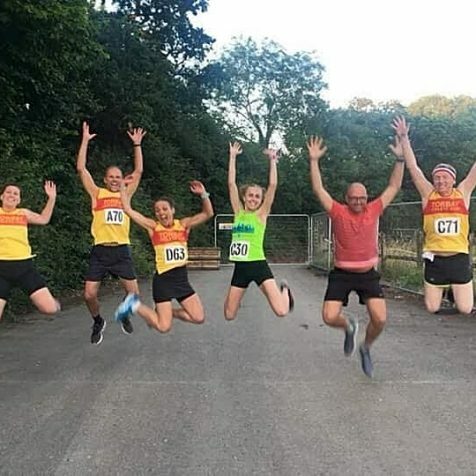 It was hot, hot, hot running from the Team Torbay at the Erme Valley Relays on Friday evening, with the Mercury as high as Team spirit as ten Torbay AAC teams gathered at Ivybridge Rugby Club for the annual relay races. Every team gave their all, in the hot humid conditions, racing around the hilly course on the 2.5 mile route to produce some fantastic results. The cheering squad was out in full force pushing every runner across the line with the prospect of a cool drink and the famous chips awaiting afterwards. Special thanks to Josie Ratcliffe for stepping up and joining the senior ladies team, Martyn Breslan for running two legs, all the runners who responded to last minute requests, and Tessa Hearfield for making sure we all got our chips and all our runners for just being awesome. Martyn Breslan (14:52) and Steve Weeks (15:24) 62:15. 56 SM. Kevin Fine (15:25), Craig McGuire (20:32), Mark Bruce (17:51), Jules Kitching (16:22) 70:09. 60 MV/50’s A, Ian Hayward (17:23), Paul Frissen (17:49), David Maxwell (18:16), Steve Wilbraham (17:51) 71:19. 72 SF, Cassandra Harrison (18:23), Josie Ratcliffe (19:29), Amy Roberts (20:38), Naomi Flanagan (15:25) 73:55 . 79 FV45’s Hayley Ratcliffe (19:58), Sara Crozier (19:24), Karen Frissen (20:04), Jo Loten (18:36) 78:02. 80 MV40B Nick Dance (19:51), Simon Gilboy (19:57), Matthew Botting (19:10), Peter McCaig (19:10) 78:08. 92 FV55’s Tessa Hearfield (21:05), Julia Schofield (20:01), Irene Hewings (21:07), Karen Baddeley (18:38) 80:51 3rd FV55 team. 99 Mixed team Emma Gilboy (20:53), Kirsten Mundy (27:06), Fleur Ricklin (18:03), Martyn Breslan (16:32) 82:34. 104 MV/50B Ray Brown (20:35), Ray Wilson (22:38), Keith Simpson (18:25), Andy Philippou (22:07) 83:45. 121 FV/35 Anita Ley (22:07), Gemma Radcliffe (25:32), Michelle Sandhu (23:14), Anita Merritt (21:01) 91:58. 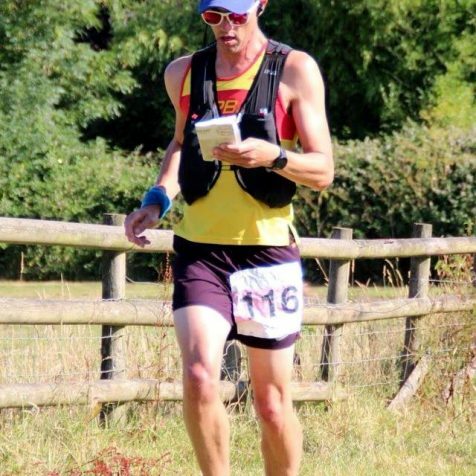 Mark Bruce ran The Greenbow Green Circle Half Marathon which took place on the trails and footpaths of the Exeter Green Circle. The route was 13.8 miles but that would depended on your navigation skills to follow the Exeter Green Circle directional arrows around the route with a map for extra guidance. Mark Bruce said “Great run in extremely hot weather conditions, which I managed to complete in (2:14:54) finishing12th from 55 finishers.